I received it from Richard Mansell under the name of "Borneo Giant", but the corms must have been mixed up. It has been identified by Dr. Alistar Hay. This is the first leaf which sprouted from a tuber that was about 1 cm in diameter. 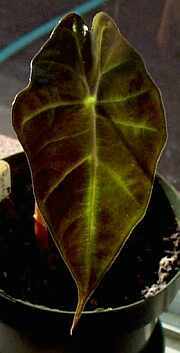 The leaf itself is 15 cm long and 7 cm wide. The second leaf was somewhat similar to A.x amazonica, and then it succumbed to some root fungus and died, so we'll never be 100% sure what it really was, since the juvenile leaves in alocasias may be quite diffferent from the mature ones.